We have years of experience with occlusal analysis using a dental articulator. Occlusal Analysis is an evaluation of how the teeth come together (occlude) with the use of an articulator. 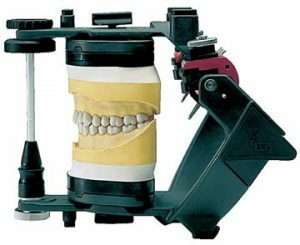 An articulator is an instrument that simulates the patient’s jaw movements with the use of dental models. The goal is to see how the teeth occlude and see if there are any negative tooth contacts when biting up & down, and grinding the teeth backwards and forward, and left and right. Two sets of mounted dental casts are made. One set is kept as a record of how the patient presented for treatment. The second set is used to analyze the occlusion. Negative occlusal contacts wear the teeth and cause the jaw joints (TMJ) to displace. A video is made of how the jaw displaces and how the teeth are modified to create an ideal, stable bite (occlusion). Some teeth are re-shaped, while others may need additions. This is a very accurate and conservative way to diagnose occlusal disharmony (malocclusion), and formulate a treatment plan. No procedures are done until the patient understands and approves of the treatment plan. In TMJ patients and complicated restorative cases, a CONE BEAM CT SCAN is done to check the condition and the position of the TMJs (temporal mandibular jaw joints). Correlating the Occlusal Analysis with the CT SCANS enhances the diagnosis and treatment plans.